Summer heat may be winding you down. It is honestly a cue for us to think of any excuse to enjoy a warm night with a tasty cocktail. Choosing a cocktail of choice may be tricky, especially for those who put a lot of concern to their health. It is not just calculating calories that makes the cocktail healthy or unhealthy. Next time you get to choose a cocktail, take a moment to think about the potential for having fruit and vegetable servings, sugar content, nutrient value, antioxidant level, and medicinal properties too. Also, do not forget to consider the flavor. For the health-conscious drinkers out there, I suggest you try Moscow Mule. Have you ever heard of Moscow Mule before? In this article we will learn about 5 fascinating things you probably do not know about Moscow Mule. So, check it out. Moscow Mule was actually born on the East Coast, in Manhattan, but then stalled on the West Coast. Some historian of drink claims that the third person was involved in the drink’s birth and his name was Rudolph Kunett, the president of the Pierre Smirnoff, Heublein’s vodka division. According to his story, the three were sipping, dining, and working toward a clever business decision that would bring a lot of benefits to the entire trio. The bartender working at the place they were meeting poured them a mix of ginger beer and vodka with a touch of lemon juice, and a moment later, the Moscow Mule was officially born. Regardless of the story above, it is generally acknowledged in today’s era that Martin was the one responsible for the rise of Moscow Mule’s popularity, because he was the one who has sparked sales of both the drink and the copper mug by going to bars and taking pictures of bartenders posing with both products. 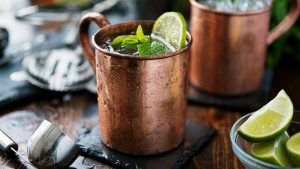 Up until today, Moscow Mule remains one of the most popular drinks in the country and still served up in the same copper mug in which it was initially created. The main ingredients of Moscow Mule include fresh lime, high-quality bottle of vodka, and artisanal ginger beer. And you would not skimp on purchasing the best ingredients when it comes to crafting a cocktail, and the same thing should be true for your barware. Moscow Mule is beautifully presented, tasty, and easy to make, so it is no wonder that they are pretty popular amongst the drinkers. It also seems that the copper mug has become virtually linked to the Moscow Mule, so much so that you would think the drink was produced on behalf of the world’s copper workers. Aside from its aesthetic presentation, we are of the camp that the copper mug of Moscow Mule not only looks good hanging from a hook in the kitchen, but also make the drink taste a lot better, even if it is only your mind playing tricks on you. What Makes Moscow Mule Taste Better? Clearly there is no scientific evidence proving that copper in the mug has some magical reaction with the ingredients in Moscow Mule, making it taste a lot better than it already does. You would be hard-pressed to defy the complete satisfaction of grabbing the handle of an icy, wet copper mug, and drinking from it on a hot summer. Those who are true Moscow Mule lovers must agree that in order to obtain an extraordinary sipping experience, one must provide the proper copper glassware to contain the drink. The copper mug of Moscow Mule is deemed as the most crucial component of crafting a proper Moscow Mule. The copper mug serves as an efficient thermal conductor and works marvels as a material used in barware. It is because the versatile metal can maintain both cold and hot temperatures and keep the drink from getting diluted. Even though the copper material of the mug does not actually make the drink colder, it still makes the drink seem colder than it would if you were drinking it out of a basic glass or mug. So, those are 5 fascinating things you probably do not know about Moscow Mule. If you crave for any delightfully fizzy drinks on hot summer days, then try to go for Moscow Mule, for it is made with fiery ginger beer, vodka, and fresh lime. However, you can also enjoy it for holiday-appropriate occasions, it all thanks to the strong ginger flavor. The drink strikes that elusory mixture of spicy, sweet, and strong flavors. Bonus: It is easy to make. You can always find the exact measurements of the ingredients in recipes online.